What Is Youtube Red : A Boon or Curse for Youtubers? 1st person : Hey do you know, how to install game from .ISO file? 2nd person : Bro, YouTube it you'll have a better perspective. 1st guy : hey how to convert this movie from .avi to .mp4 ? 2nd guy : Bro you need to download a converter instead of me explaining, why don't you YouTube it? That's how basically our world has immensely shifted within past 2 years from "Hey, Google it" to "Simply, YouTube it". Everyone tends to prefer an easier route & what a better way to understand virtually anything, than watching the stuff happening right in front of you via YouTube. Trust me teenage kids prefer YouTubers as their daily dose of entertainment, instead of watching boring shows on TV. YouTube has really picked up momentum this year and according to a survey there's 60% increase in total watched videos on YouTube every next year. YouTube is a platform which gives entrepreneurs a chance to showcase stuff & excel in their niche. Some of the content creators like PewdiePie, IISuperwomanII, Niga Higa, Mkbhd, Slow mo guys etc have really taken things to the next level which eventually have changed their lives forever. Well if you're talented enough, nothing can stop you. Youtubers are also paid for creating videos, which is essentially via Ads. If you watch entire ads, then & only then respective ad network pays to the YouTuber. If you skip ads, the pay isn't delivered to that Youtuber. Although pay also depends on number of views a particular video received, which is if you're signed-up into YouTube's partner program. Since this doesn't particularly end up well in terms of an overall pay, that a Youtuber receives for creating an really awesome content(Video), Youtubers are most likely to head over onto other networks & host their videos on their services like kickstarter, patreon.etc just to earn sufficient money. Google knows that YouTube is big but it can eventually turn into something even bigger, the problem is to find that next step. They had introduced many things on the way such as paying for a channel to watch specific channel videos, exclusively but that didn't work out well back in 2013. So YouTube is back with something called 'YouTube Red' which is a package that brings Ad-free subscription service that'll cost you $9.99 a month with the inclusion of Youtube Music along the way. Is it a threat or treat to Youtubers? Let's find out. YouTube Red is just another way to browse YouTube ads-free, which means you're going to watch every single video ads-free & as a added bonus you get membership exclusive videos, that are available for Red-Members only. In short if you live in India, you're going to be free from that Airtel 4G Girl, finally! (Do share your annoying ads experience below). Essentially what happens is when you're notified that your favourite Youtuber has uploaded a video, You head over his/her channel to watch that, but then the ad pops-up(non-skippable) which is pretty annoying. Youtube Red is soon going to eliminate this providing users an option to watch your favorite videos uninterrupted. 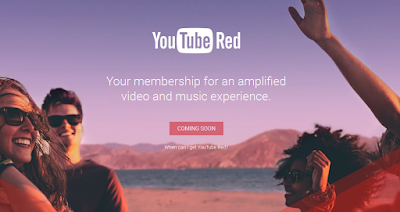 So what does YouTube Red Membership provides as a package? It lets you save videos offline onto your device storage. Though this feature is already available in few countries having lower bandwidth speeds with the original YouTube app but you cannot take each and every video offline here, but Youtube Red provides that. It let's you play videos in the background which means if you're watching any music video(by an singer) and let's say you received a text & if you switched to messaging app, the music will continue to play in the background. This program also includes the newly launched Youtube Music & addition of earlier YouTube Gaming(Ads-free). Being a member you'll get watch some exclusive new Original shows & Movies by YouTube's best talents, which won't be available for normal Youtube subscribers. All this good stuff for just $9.99/month, which if you ask me is pretty solid stuff for that bundle. Alright what's Youtube Music, now? Youtube Music is an app designed specifically for enjoying your favorite music. This can be called Spotify/Pandora/Apple Music except you can even enjoy Video here. But wait there's more Google Play subscription is tangled-free with YouTube Red membership. Coughs, Spotify & Apple Music. Though you've to wait for it, as YouTube team said that they would be releasing YouTube Music soon. Members here would be accessing some Shows, Movies and Videos specifically from Best Youtubers. Just in case, you can enjoy PewDiePie's new horror series created and produced by Walking Dead Team, while Superwoman's movie on how Lilly Singh goes to a world tour & so much more here's the link. Spoiler : This will be available next year. So now let's face the moment of faith, is Youtube(free) going down? Actually Nope, it isn't. Atleast not until Ad networks bolster ads on all videos, just to get the same results on their products by removing skip-ads tags. But the fact is that free(ad-supported) version is still here. Also a quick update that Google has claimed that they would be expanding YouTube Red, Music, Gaming & YouTube Kids apps to a global audience, adding many countries soon. So at the end of the day Google says you can still enjoy each & every YouTube video free of cost with ads-included. Though Users with Youtube Red Membership will get all that happiness ads-free & in return you're supporting your favorite Youtubers, by paying for this service. YouTube Red will be first available to residents in US with a one-month free trial on October 28 here. Pro-tip : YouTubers in US should analyse the period of 28th October - 28th November on their analytics dashboard, to calculate & compare the earnings to that of previous month. That would actually be a moment of faith when Youtubers could recognize, whether this service is a hit or a miss. 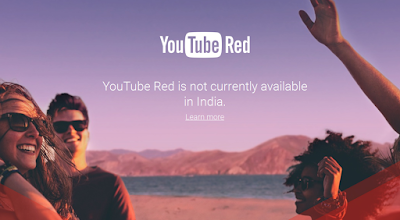 So YouTube Red is a superpower that Youtube received, which would suit your daily needs & replace your Music App. Put forth, it's here to stay. Also See : Is HTC One A9 a Sequel To Apple's iPhone 6/6S or HTC One M7 ?